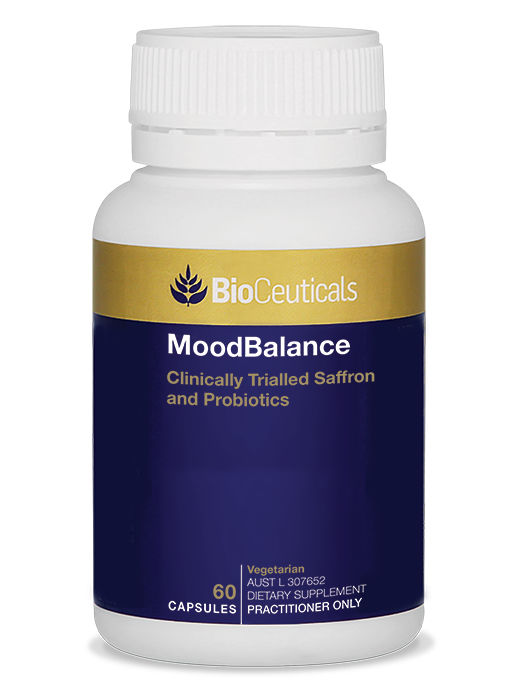 A combination of a standardised and clinically trialled ingredients for healthy mood balance. Standardised, clinically trialled saffron with a clinically trialled combination of probiotics, plus B vitamins, for healthy mood balance and reduction of the stress-related gastrointestinal symptoms of nausea and abdominal pain. Crocus sativus (saffron) has been used in traditional Persian medicine to support healthy mood balance. 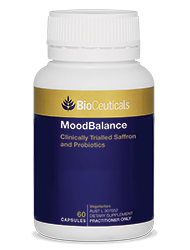 MoodBalance contains affron®, a standardised saffron extract. Includes clinically trialled Lactobacillus helveticus R0052 and Bifidobacterium longum R0175, which reduce the stress-related gastrointestinal symptoms of nausea and abdominal pain. B vitamins contribute to supporting a healthy mood balance. Vitamins B6, B9 and B12 are essential for processes involved in the synthesis of neurotransmitters, and zinc supports healthy neurotransmitter system activity. Vitamin B6 and zinc contribute to normal functioning of the immune system. The lactobacilli strain helps to support a healthy gastrointestinal system and immune function. Adults: Take 1 capsule with breakfast and 1 capsule with dinner or as directed by your healthcare practitioner.